Protect those baskets from the Funny Bunny! It's Easter and your friendly neighborhood BAMF! will be open normal hours today (11 am to 5 pm). We'll see you at the shop! Saga: Compendium One coming this October AND the continuation of the series! Saga: Compendium One cover by Fiona Staples. Wipe those tears away that you shed from the heartbreaking ending of issue #54 and REJOICE; as there’s some beautiful SAGA news ahead! While we’re still waiting on the announcement by Vaughn and Staples as to when the series will officially return, Saga: Compendium One will be hitting BAMF! October 16th! 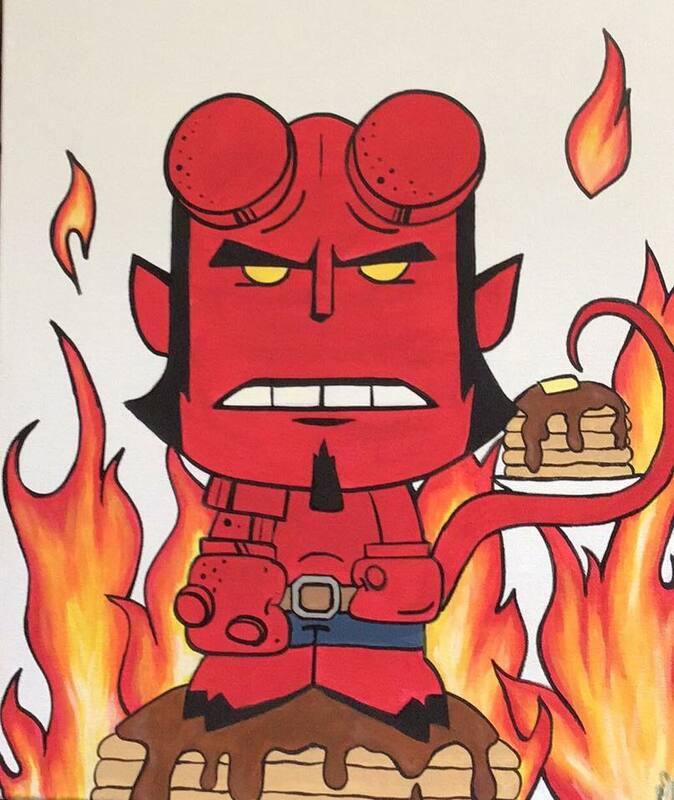 Hellboy Painting Class at BAMF! "You can't have noodles for breakfast. You're gonna have pancakes." As always, all are welcome to the painting event. We'll see you at the shop! SHAZAM! Advance Screening with BAMF! BAMF! 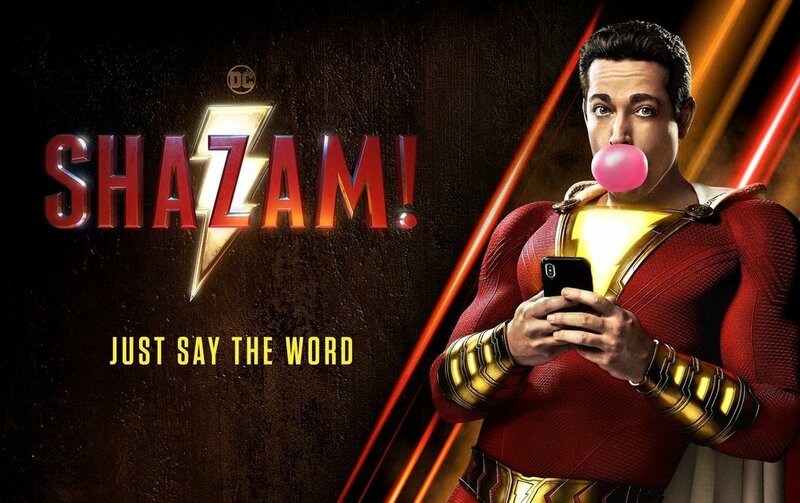 has your chance to see an advance screening of SHAZAM Monday, March 18th (7:30 pm) at the Regal Cinema in Winter Park! Thanks to Warner Bros. Pictures we have passes available via a download link. Simply visit WBTickets.com and enter the code SHAZAMBAMF to claim your tickets. Pass valid for up to 2 Seat(s) and seats are on a first come basis. Meaning you’ll want to line up early (1 to 2 hours) to better your chances of obtaining a seat. Okay...Finally! We’re having our first ever back issue sale and it’s one day only! Saturday, February 23rd from 11 am to 8 pm. A multi-tiered attack on the massive amounts of collections we took in over the last few months. Check out the above flyer for all the details. Remember, Saturday only from 11 am to 8 pm. Come help us make space...we need more room for other collections and this sale is going to be the cure! Uncanny X-Men, Dead Man Logan, Extermination, Next Gen, and X-Force. Ed Brisson continues to create riveting and innovative stories that are providing a fresh take and streamlining Marvel's X-Universe. Meet Ed, in person while he's visiting BAMF Wednesday, March 6th from 4 to 8 pm! That's right, writer Ed Brisson will be joining us for a signing (4 to 7 pm) and a special in-store Q & A (7 to 8 pm). Artist extraordinaire Mike Perkins will also be joining us Wednesday, March 6th for an in store signing from 4 to 7 pm with a special Q & A from 7 to 8 pm! Mike Perkins is a comic book illustrator having worked on Captain America, Thor and Spider-Man. After wrapping up the 31 issue adaptation of Stephen King’s The Stand he transitioned into illustrating Astonishing X-Men and has since successfully re-launched Deathlok, Carnage and Iron Fist . He has recently transitioned to DC comics where he has depicted the adventures of the Green Lanterns and Swamp Thing. He has been nominated numerous times for Eisner and Harvey Awards and, as well as winning the Eagle Award, counts being on the New York Times Bestseller list and being exhibited in Munich, London and Paris amongst his career achievements. Children's Illustration Class at BAMF! Discover two famous African American heroes and their history while learning to illustrate powerful images by using perspective during this month's Children's Illustration Class. Whether flying towards you or leaping into action create a colorful illustration of DC hero Green Lantern John Stewart: American war hero and Justice League member. Or you can paint a king and warrior, Wakanda's own leader T’Challa, better known as the Black Panther and member of the Avengers! Who will you choose to save the world in this two part dedication to strong Africa American hero’s in the DC and Marvel universes! *****************THIS CLASS IS FOR T'Challa/Black Panther on SATURDAY THE 23rd. Seating is limited to 10 students for this class. Please pre-pay to secure your spot(s)! Professional instruction on drawing techniques and watercolor painting. All the supplies you need to create your own watercolor painting of Black Panther. ************THIS CLASS IS FOR JOHN STEWARD/GREEN LANTERN on SUNDAY THE 24TH. Seating is limited to 10 students for this class. Please pre-pay to secure your spot(s)! All the supplies you need to create your own watercolor painting of GREEN LANTERN. Happy Groundhog Day from BAMF! 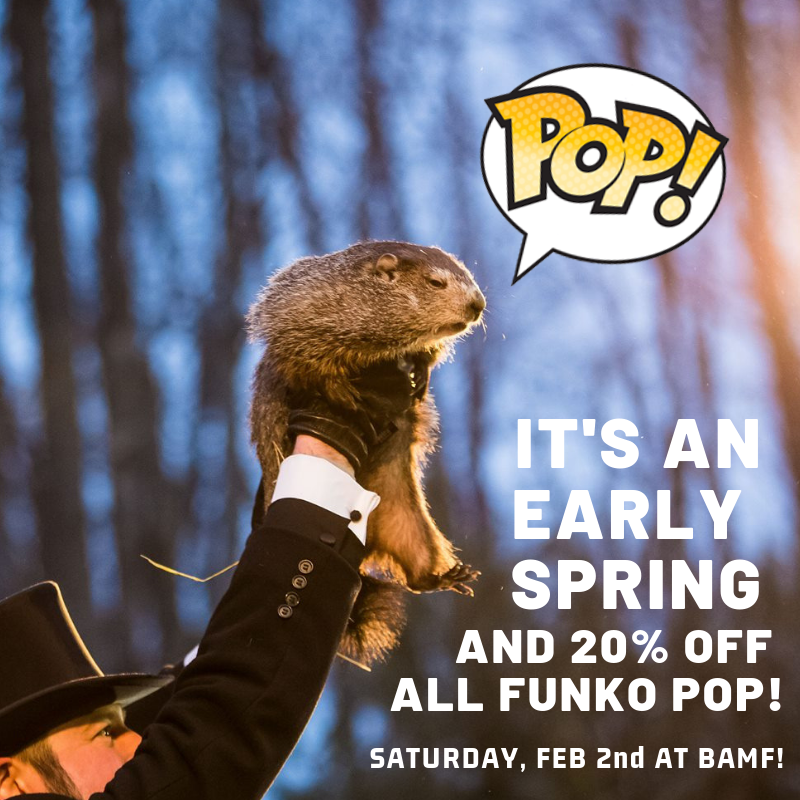 Punxsutawney Phil didn’t see his shadow this morning so it’s an early Spring and 20% off all Funko POP in the shop! That’s right, today from 10 am to 8 pm we’re welcoming an early spring with a special sale on ALL Funko POP. We’ll see you at the shop! We'll see you at Orlando Toy & Comic Con! It's all going down next weekend and BAMF! will be in attendance with special giveaways and incentives for those visiting our table! Mark your calendars and we'll see you at the show!! 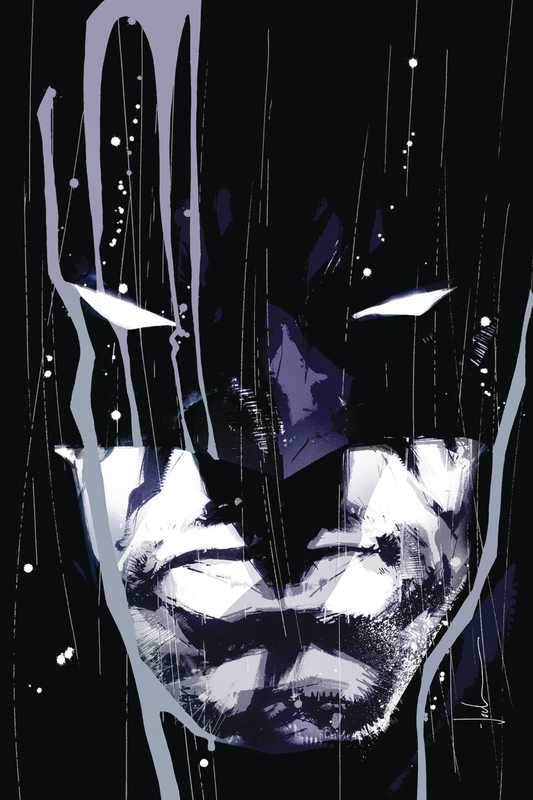 Detective Comics #1000 Midnight Release at BAMF! The Dark Knight turns 973 and we’re celebrating this March at BAMF! Comics. You’re probably saying to yourself “Batman looks good for his age” and it’s true, the caped crusader has endured several decades and still remains one of the most recognizable and successful comic characters in history. Detective Comics #27, featuring the first appearance of Batman, was released in 1939 and was created by Bill Finger and Bob Kane. 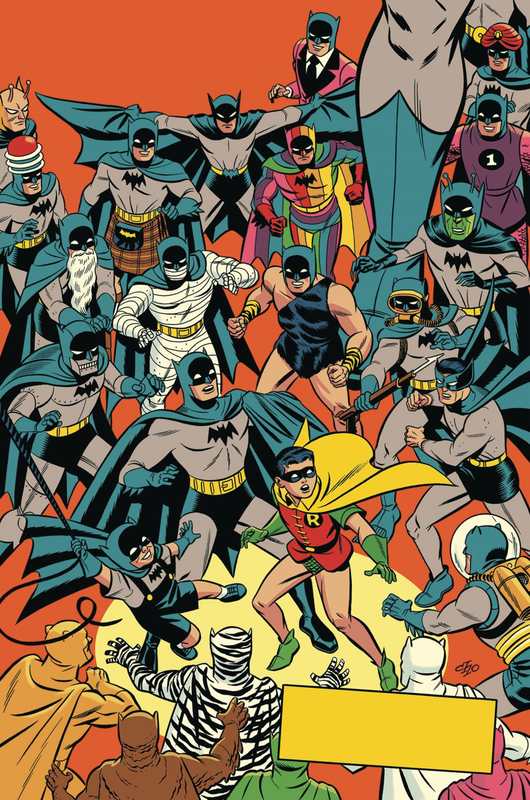 Almost 80 years later Detective Comics reaches it’s milestone 1,000th issue and DC is celebrating with an over-sized 96 page issue to commemorate. Check out all the variants below, spanning 9 decades, from a variety of amazing artists including Frank Miller, Bruce Timm, Bernie Wrightson, Jim Lee (pictured above) and MORE! As a special incentive for those wanting to buy all 10 of the variants, we’re offering a special BATBUNDLE for only $80! Bundles available while supplies last. Pre-order yours now to ensure you don’t miss out! 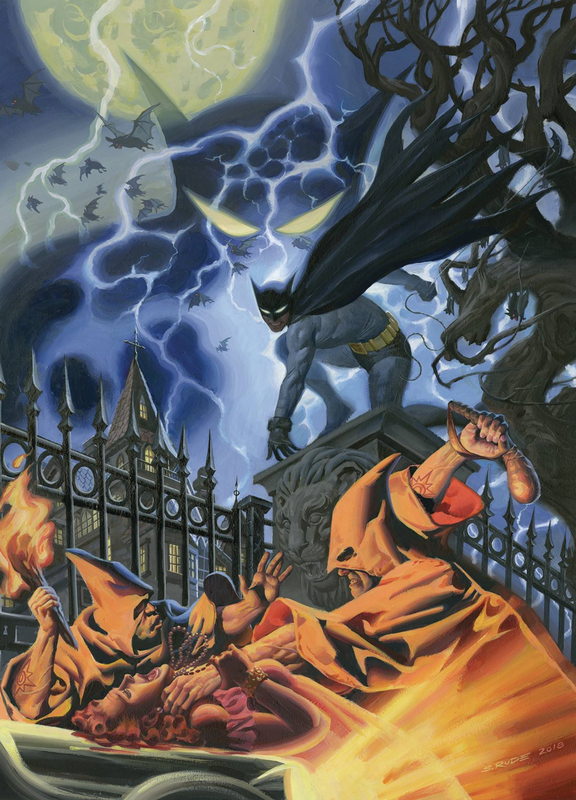 Not only will we have a plethora of great variants for the special 1,000th release, we’ll also have the 424 page Detective Comics 80 Years of Batman Deluxe Hardcover available in shop! Add to that, there will be great food and drinks to celebrate the release including Batpizza, Batcookies and Batdrinks! Mark those Batcalenders because this is going to be a great event you won’t want to miss! Happy New Year from BAMF! Comics & Collectibles!!! Happy New Year from all us here at BAMF! We're open today from 11 am to 7 pm so stop by, check out the new collectibles we've been processing or simply take a load off and hang out. Either way, we'll see you at the shop! We want to thank everyone who made it out yesterday for our round of holiday activities! From Santa Claus to the Record Shop Pop-up, D&D and gingerbread making it was an grand and festive time! New comics on schedule at BAMF! for the holidays! Rejoice! The United Parcel Service has come through and new comics will be available tomorrow (12/19) as usual. Not only that, we have next week's shipment (not available until 12/26) in shop! That means no delay for holiday shipments! Weekend of sales continues at BAMF! Our weekend sales continues Saturday 12/15 & Sunday 12/16 with 25% off all toys at BAMF! That's both loose and carded toys with the only exclusion being Funko POP. With collections hitting almost daily, our inventory continues to grow so stop by and check out the new stock. We'll see you at the shop! Small Business Saturday 2018 at BAMF! It's Small Business Saturday and we're celebrating with special sales throughout the store today! 25% off statues and busts, 20% off all board & table-top games, BOGO on all age comics and 20% off Funko POPS! Be sure to stop by and pick up your BAMF! 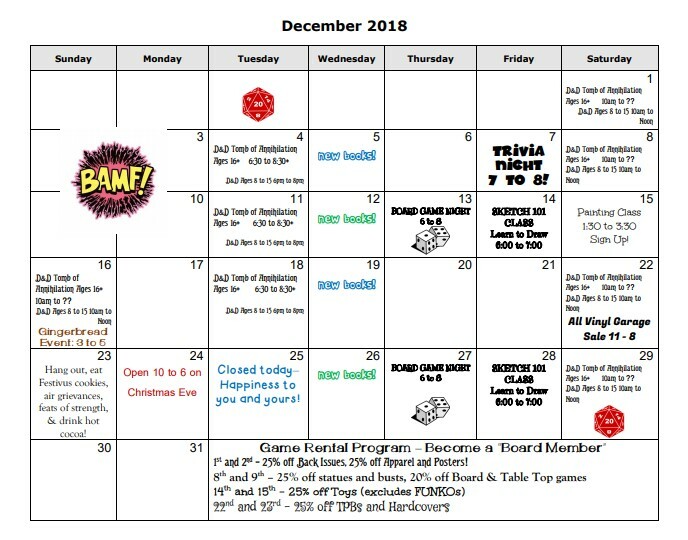 sales calendar to catch the weekend sales we're hosting throughout the month of December! We'll see you at the shop! There's an inter-galactic conspiracy afoot AND a traitor among the Corps! From Grant Morrison and Liam Sharp comes Green Lantern #1 and BAMF! will be selling copies at Tuesday at Midnight! That's 12:01 am 11/7 to be precise. BAMF! will have plenty of copies in stock including that stellar variant cover by Frank Quietly AND the special B&W Midnight release variant! Halloween 2018 Hours at BAMF! Halloween is this Wednesday and BAMF! will be closing an hour early (7 pm instead of 8 pm) to be with our families for trick or treating and other seasonal festivities! Nonetheless, we'll be open at 10 am with new comics, candy and HCF comics. Halloween Comic Fest 2018 at BAMF! Join us Saturday, October 27th from 11 am to 8 pm as we celebrate Halloween Comic Fest at the shop with tricks, treats and FREE COMICS!! There are over 30 Halloween Comic Fest comics this year and we've got them all while supplies last! Add to that there’s no limit on how many titles you pick up! We'll also have buttons and other HCF giveaways AND 20% off store wide (exclusions apply). There will be prizes for each age group including gift certificates and merchandise! Trick or Treat for candy at the shop and be sure to get your photo taken at our "Spooky House" in store! October 18th Trivia Night and upcoming at BAMF! While we had to unfortunately cancel our trivia night due to the illness of our host, we are hard at work structuring our upcoming trivia nights. From Star Wars, to Marvel and the Walking Dead we have some fun and challenging nights planned ahead! We'll be updating this space soon with a full schedule of our upcoming trivia nights.